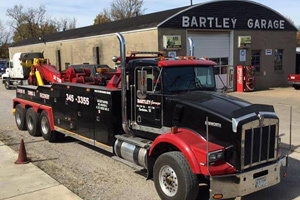 Here at Bartley Garage, we are a full service auto and truck repair shop proudly serving Charleston, Illinois and surrounding communities. We specialize in the repair and service of large trucks, semi trucks, dump trucks, cargo and utility trucks. We ensure the very best craftsmanship and customer service. We believe our customers satisfaction comes first, so we back our repairs with the appropriate warranties. Our staff at Bartley Garage is committed to maintaining a highly ethical and sound business practice in order to meet and exceed our customers auto and truck repair needs. We provide emergency roadside assistance, automotive and heavy duty towing, and accident removal. Call us anytime! Our emergency services are available 24 hours a day, 7 days a week! Call or stop by Bartley Garage for all your auto and truck repair needs!